All Saints Day is a national religious holiday all over here in the Philippines. And it is celebrated every November 1. This is not only a day to remember the dearly family treasured ones that died, but this is one of the special days where hundreds and thousands of families all over the country gather once again in their native towns or cities not only to pay homage to their lost loved ones, but to renew their families ties among themselves until New Year comes. The living are paying a visit to their departed loved ones at the cemetery, or in the memorial park by bringing flowers, lighting a candle or holding a mass through a paid Church minister or priest. People every year in All Saints Day keep on coming home, keep on visiting and decorating their dead one's tomb with something of great values for their dead. And they keep on doing this as a tradition. Are they not thinking of situation or condition of their dead who aren't capable of saving themselves? Five years ago, I posted in my web about "Redeeming the Dead" by baptizing them through a proxy. Sound ludicrous? Isn't it? But try to reconsider the following truth of salvation about this. The Church of Jesus Christ of Latter-day Saints believes that their dead could be saved through a vicarious baptism, particularly Baptism for the Dead, an ordinance opening the door to the celestial kingdom to worthy persons not privileged to undergo gospel schooling while in mortality. Based on the eternal principles of vicarious service, the Lord has ordained baptism for the dead as the means whereby all his worthy children of all ages can become heirs of salvation in his kingdom. Sometime after birth into this life and before resurrection and judgement, every living soul will hear the gospel message and be judged by his reaction thereto. Millions who pass to the spirit world without receiving an opportunity during mortality to hear the truths of salvation will receive their chance subsequent to what men call death. 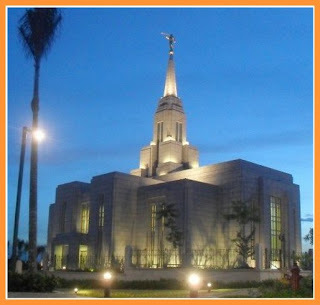 For the Latter-day Saints (LDS), salvation for the dead is the system where those who would have accepted the gospel in this life had they been permitted to hear it, will have the chance to accept it in the spirit world, and will them be entitled to all the blessings which passed them by in mortality. This is an interesting trivia on Latter-day saints and Halloween. It's good that we have a day for our departed love ones. Those who seek eternal life must follow the example of our Savior by being baptized and received the gift of the Holy Ghost. As what was written in the Bible, JOHN 3:5-"JESUS TAUGHT BAPTISM IS ESSENTIAL TO THE SALVATION OF ALL WHO LIVED ON EARTH". However, many have died not receiving this or some are baptized without proper authority. And because God is MERCIFUL GOD, He has prepared a way for all people to receive the blessings of baptism by performing proxy baptisms in behalf of the DEAD ONES. This is my first time to read about Mormon's beliefs. I respect your belief bro and I will not go into a debate with you regarding this sensitive belief. What I believe in is that God is a god of Love, and He will do all to save each and every soul from hell's torment. We learn from each other's faith as I've certainly learned something from you today. We may be having different kinds of beliefs when it comes to salvation. But I respect you with what you believes in. Thank you for sharing this one, at least now I have some insights about the LDS. We maybe of different religions. But one thing's for sure.. we all continue to hope and pray for each and every person to hear the word of God, before departing this world. Though we have our own practices in remembering our departed, its nice to know that at the end of the day, it is dedicated to them. I don't really have that much knowledge about Latter-day saints.. But I think, everyone of us always have our way of remembering our loved ones who already passed away. Thanks for sharing this information Sir Gil. Never been into a Latter-day saints church or something, but indeed they have rich tradition when it comes to religion as well, so do with their way of remembering the dead. Thanks for quoting the Matthew scripture. It's my first time read that quote. I'll always remember that I found it through you. Thanks Again! 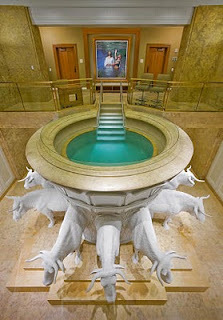 I have to admit, that is one really fancy pool for a baptism. I have to say, I don't really agree with much of the things that you pointed out. But like Papaleng, I respect them. I respect your opinion. You've the right express it. I just want to point out for your information about "fancy pool for a baptism" It is not in any manner as "fancy" It has spiritual significance. And the dead being baptized there is not the actual dead but they're being proxied or substituted by their living member of their family. They just take upon themselves the names of their dead, one at a time. It's my first time to hear about the Latter-day Saints. It's always nice to know something new. Thanks for sharing, Sir.